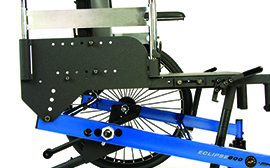 The Eclipse is a rigid manual wheelchair designed for bariatric users. Available in a wide array of sizes, the Eclipse supports up to 1000 lbs. 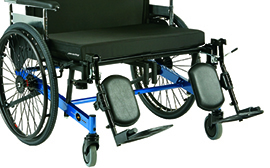 Forward extended casters achieve optimal weight balance on the rear wheels for excellent maneuverability. Overall width is one of the narrowest available allowing for improved door clearance. 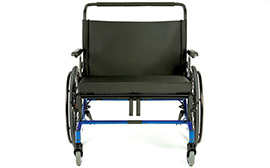 Removable wheels, backrest and armrests and front riggings for easy transportation. 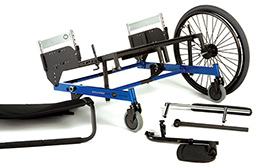 Allows for more weight to be distributed on the rear wheels, making it easier for foot, hand and attendant propulsion. Seat-angle adjustability on chair for comfort and posture control. Compact chair designed to allow easy passage through narrow doorways.